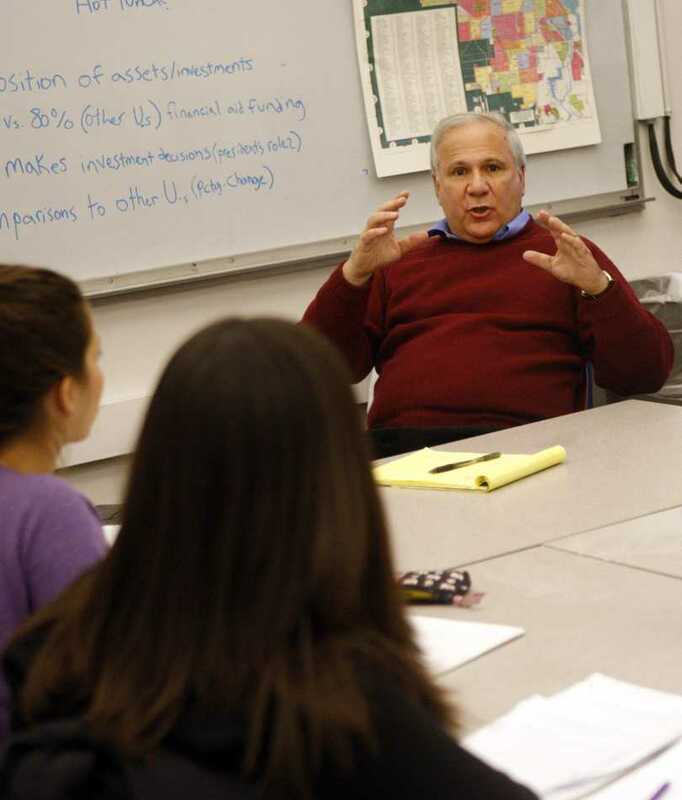 Former Medill Prof. David Protess speaks with students during an Innocence Project meeting at Northwestern in 2009. Protess and NU are defendants in a suit filed Tuesday by a former inmate who was recently freed after spending 15 years in prison. A man is suing Northwestern and other parties for $40 million after he says he was coerced to plead guilty to a double homicide and spent 15 years in prison following revelations by an NU journalism class. Alstory Simon filed a lawsuit Tuesday in the U.S. District Court of Northern Illinois seeking redress for the time he spent in prison after he says he was wrongfully incarcerated for the killings. Cook County prosecutors threw out his conviction in October. In a landmark case that garnered international attention and contributed to the end of the Illinois death penalty, a 1998 class led by Protess found evidence that overturned a death sentence against Anthony Porter in the 1982 murders of Jerry Hillard and Marilyn Green. Porter was originally found guilty of the double homicide. Ciolino, a private investigator working with the Medill class, obtained a video of Simon confessing to the killings. Simon pled guilty to charges of murder and manslaughter and was sentenced to 37 years in prison. However, in October, Cook County prosecutors threw out the conviction of Simon when questions were raised about the integrity of the investigation by Protess’ class, which was part of a program later named The Innocence Project. In his suit, Simon claimed Protess instructed students to “develop evidence of Porter’s innocence, rather than search for the truth.” He claims he was coerced to falsely plead guilty to the murders when presented with fabricated evidence and “terrifying” threats. In a statement today, University spokesman Al Cubbage said the University is reviewing the lawsuit. “Northwestern denies all wrongdoing in this matter and looks forward to being vindicated in a court of law,” he said. Protess did not immediately respond to requests for comment about today’s suit. Rimland told The Daily he had not yet reviewed the case. However Ciolino has admitted in the past that he showed Simon a video in which an actor posing as a witness implicated Simon as the gunman. In a statement today, Ciolino said Simon confessed to others, including a Milwaukee TV reporter. James Sotos, an attorney representing Simon with Terry Ekl, criticized Ciolino’s claims that no coercion was used to obtain Simon’s confession. “I’ll tell you I not only dispute it, I find it reprehensible that he can continue to say that,” Sotos said. Sotos cited a 2002 Chicago magazine interview where Ciolino described the video confession. “We just bull-rushed him, and mentally he couldn’t recover,” Ciolino told Chicago magazine. When Simon was freed in October, Cook County State’s Attorney Anita Alvarez said following a yearlong investigation by her office that the class used “alarming tactics” in its investigation. The investigation, which involved interviews with more than 100 people, did not determine who carried out the killings. Ciolino defended the Medill class’s findings at the time to The Daily, saying the video confession spoke for itself. The lawsuit also says very little journalism was conducted by the Protess class, arguing students did not submit any articles about the case for publication. It accuses the University of supporting the investigation to “enhance” the reputation of Medill. The lawsuit cites several books and TV movies made about Protess’ work that may have boosted the school’s reputation and attracted top students to apply to the school. On Tuesday, Cubbage also said David Protess retired in 2011 and is no longer employed by NU. Protess stopped teaching at Medill after he was barred from teaching the Innocence Project class and then-Dean John Lavine publicly accused him of doctoring records from a separate investigation into a 1978 slaying. At the time, the University said Protess had misrepresented facts and actions to the University in a case investigating the murder conviction of Anthony McKinney. Protess now leads the Chicago Innocence Project. Medill Prof. Alec Klein now leads a similar course into investigating potential wrongful convictions, rebranded as part of the Medill Justice Project. Klein deferred comment for this story to University spokesmen. Cubbage declined to comment on whether or not the litigation will affect that course’s ongoing work. This story was updated Wednesday at 4:20 a.m.